Tile has been my favorite Bluetooth tracker since several months ago when I got myself a Tile Mate. Some people complains about Tile not being rechargeable, yet not being rechargeable is one of my strongest reason of liking their products. One of the main reasons of putting Bluetooth tracker is because we can’t always remember them. Having to remember to charge our trackers every few days, or every few weeks would definitely bring people like me to the scenario of missing item plus tracker with empty battery. With the tracker being so small and compact, a battery could only be non-rechargeable but can last months, or rechargeable but will need to be charged every few weeks. There is no commercially available battery that size that could last a year yet can be recharged. Replaceable battery is another whole discussion. For me, making the battery user-replaceable would definitely result in significantly bulkier tracker, which is a major turn off for me. If there is a complaint I can make about Tile Mate, it’s the fact that when serving as my keychain, its white design got dirty very easily. My Tile Mate still works fine after 7 months, but it looks awfully ugly now. When Tile announced the Pro series with Tile Style and Tile Sport models, I got excited. So I jumped and got one. I have seen what my keys can do to a white tracker, so I choose Tile Sport instead of Tile Style. Just like its pictures, Tile Sport looks much stronger and sturdier. Being a newer Pro model, it packs louder sound and longer tracking distance. I tested the louder sound, when I put both Tile Mate and Tile Sport on a table and ring both of them from another room, Tile Sport does sound a bit louder. However, when I put them in my jeans’ pocket, I barely can tell the difference. I can still hear both of them, but it’s because I consciously know where they are. Still nice to know that my tracker could sound louder, even though the effectiveness of the extra volume is still be proven in the future. Unfortunately I wasn’t able to test the maximum tracking range. I already put Tile Mate on one corner in my house and ring it from a phone at the furthest spot from it inside the house, and it could still ring. So until I can afford myself a bigger house, I would have to put this test on hold. Or maybe if I find an opportunity to do this outdoor, or at work without embarrassing myself, I’ll update this post. 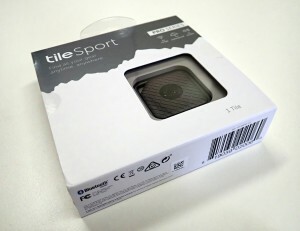 The button on Tile Sport is built slightly lower than the surface of the tracker. This subtle detail means a lot to me because it makes it a lot harder for me to accidentally press the button. I usually put my keys on my back pocket. I lost count on how many times my Tile Mate rang my phone from accidental pressing. I am quite confident that it shouldn’t happen so often anymore with Tile Sport. Overall, I find this a nice little upgrade to my favourite Bluetooth tracker.